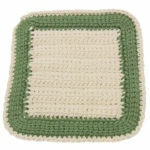 Ribbed Can Cozy -- $1.99 A Crochet pattern from Julie A Bolduc. This is just the right size for a tight fit onto a 12oz soda can. You can make it longer for taller cans by just adding a few rounds. It is fast and easy to make and is very thick.